Timber has been a staple building material since earliest times, and by the start of Britain's Industrial Revolution in the late 18th century, it was in considerable demand for bridge building. During the Railway Age — an era defined by the emergence of steam-powered locomotives and early mainline rail networks — a great number of viaducts and bridges were constructed in timber. Interestingly, timber continued to be used through the 19th century, despite a predominant use of stone for bridges, an increasing use of brick arches and the availability of new materials, such as cast iron, wrought iron, and later, steel. In Wales, timber was particularly suitable for the large structures needed for the new railways, as it could be shipped directly from the Baltic Sea area and was far cheaper than iron or steel. It could also easily be fabricated on site and worked without the need of a forge. Isambard Kingdom Brunel (1806-59) is often cited as one of the most prolific users of timber spans for main and branch line railways, employing treated timber elements for bridges and viaducts. In addition to many railways elsewhere, he was responsible for a number of projects in Wales, including the South Wales Railway and the Vale of Neath Railway. The timber viaducts he designed for them are the principal subject of this essay, along with the structures designed by Benjamin Piercy (1827-88), Henry Conybeare (1823-84) and George Owen (c.1827-1901) for the various Cambrian Coast railways. However, there is a Welsh engineer, a contemporary of Brunel but less well known, who was significant in Welsh timber viaduct design. Rhys William Jones (1804-64) was responsible for a major timber road crossing of the River Loughor near Swansea. This bridge pre-dates, and possibly influenced, the design of Brunel's Loughor Viaduct. More about Jones can be found in section four. Other engineers of this period also championed the use of timber, working in various locations around Britain. Examples include William Cubitt (1785-1861), Thomas Longridge Gooch (1808-82), John Green (1787-1852), Robert Stephenson (1803-59) and John Sutherland Valentine (1813-98). In general, the way in which timber components were used was designed to facilitate their replacement while a viaduct was in service, should the components become decayed or defective. Brunel's timber truss structures, particularly the 'fan' types (described in later sections), used propped multi-span beams to create the trestles of the viaducts. By comparison, Cubitt's designs have been referred to as "propped beams, extended queenpost trusses". Those by Gooch have been referred to as "double polygonal arches". 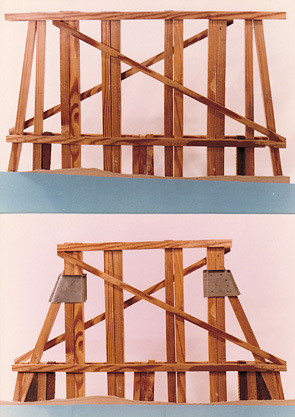 Green's have been called "multiple span, elevated laminated arches", while Stephenson's are referred to as "polygonal arches", and Valentine's as "laminated bowstring trusses". 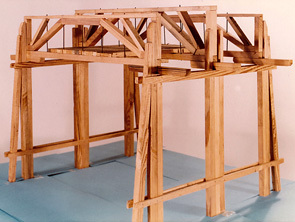 Model of a single trestle span of Brunel's Loughor Viaduct, as constructed in 1852. The 18-span viaduct carried two tracks of the South Wales Railway. The models on this page were created by timber engineer Christopher Wallis (1935-2006), youngest son of Sir Barnes Neville Wallis (1887-1979), inventor of the bouncing bomb. Further models showing the treatment of timber outmembers.